A few days ago I got a request for a few dresses to wear for special occasions. 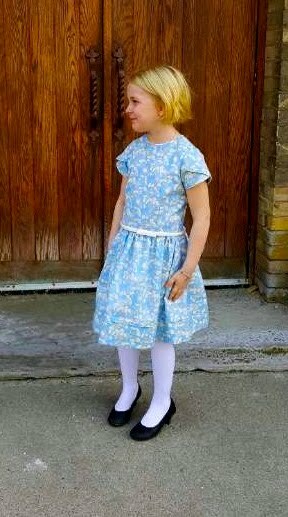 So I quickly whipped up a Fairy Tale Dress using a pretty blue Liberty print. But as soon as the dress was finished, it was whisked away even before I got a chance to remove the blue markings for the zipper and double check for stray threads! Needless to say, I didn't get any photos of the dress on the hanger let alone on the wearer. So in my best whining voice, I asked for some photos and this is what was sent to my Blackberry. 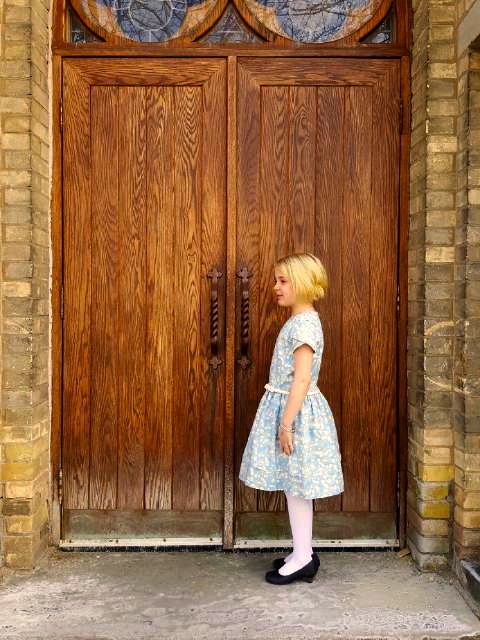 Nice shot of the oak doors. Well, at least you can't see the blue wash-out pen marks around the zipper that would be more than visible in a regular photo. As for stray threads ..... who knows? No matter. I do appreciate that our model co-operated despite being exposed to chilly morning air and her mom (my daughter) didn't forget to send me photos. The bottom line is you can't go wrong with a Fairy Tale dress. It's easy to make, looks good and it fits like a glove. However it's too bad you can't see the tucked hem on the dress. The machine tucked hem saved time instead of hand sewing so I could get the dress done quickly and sent off to wearer tout suite. Hence no photos and my whining. Oh, it is so pretty, it goes well on the wearer! Oh you're a champ Deb! I fully understand the desire to show off a good sewing job with nice photos. Good thing we can imagine all the perfect details! Is it almost time for baby deer to be in your garden admiring your sewing on the mannequin? 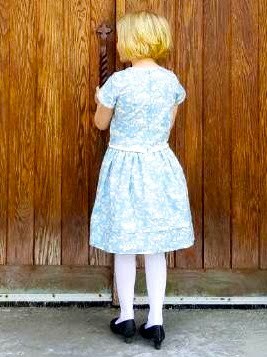 You looks so grown up, it is a beautiful dress and I like the arty door photos. Oh I love it! Perfect fabric choice for it. Think this will be the next Oliver + S pattern I'll get. I love those cap sleeves.